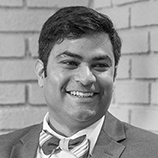 Kedar A. Kulkarni received his PhD in comparative literature from UC San Diego in 2013, and has been a postdoctoral fellow at Yale University and the Center for the History of Emotions at the Max Planck Institute for Human Development, Berlin. As a comparativist, his main interests lie in Indian literatures, their performance, and Indian drama. He is particularly interested in the intersections between printed/textual materials and their spread through performance. He is also interested more generally in postcolonial drama and literature.